On May 5, 2003, we were ready to launch LinkedIn with the vision of building the world’s first and largest professional network. 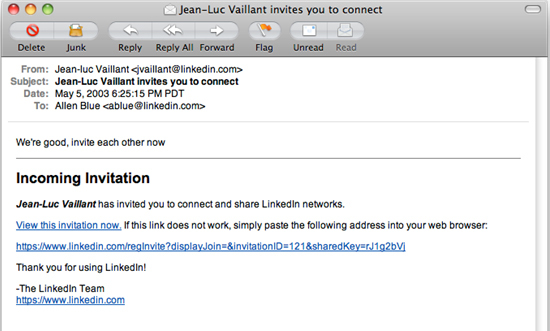 Jean-Luc Vaillant, vice president of engineering at the time, created the first account and sent an invitation out to each of the 11 founding team members. This invitation started it all. Initially, it was an exclusive club. We only invited each other–getting the whole founding team connected at the core of the LinkedIn network. We became “Generation 0” of the network, and once part of this group, we were allowed to invite people outside the company. From that first invitation, our network has grown to more than 120 million professionals worldwide, adding two members a second across 200 countries. This simple invitation has had far reaching implications to the evolution of today’s global workforce and digital professionals as we know it.